-- Select a Size -- 12 In - Out of Stock! 24 In - Out of Stock! Need to walk three dogs and only have one leash? We have the answer - the Zack & Zoey™ Jet Black 3-Way Coupler Leash. 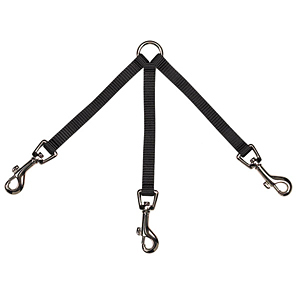 Our Zack & Zoey 3-Way Leash Couplers allow three dogs to be walked together more efficiently on one lead. Thanks to this clever concept, now there is no need to have a tangled mess of multiple leashes and multiple dogs! Improve your walking enjoyment and safety when walking more than one dog. Instead of feeling like a maypole, your dogs will learn to work together to move forward instead of getting distracted and pulling you every which way but ahead. To use, simply attach one nickel-plated swivel clip to each dog's collar. Then attach your single leash to the center ring. 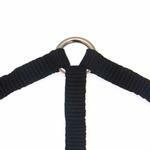 Our couplers are available in several colors to coordinate with different color leads, collars, and harnesses. We also carry 2-way couplers if you have two dogs to walk. For best results, be sure to choose the right coupler size for your dogs. The 4" coupler is designed for small breeds. The 12" coupler is for medium to large breeds, and the 24" coupler provides the greatest mobility for the largest breeds. If there is a large size discrepancy between your dog sizes, a longer coupler will be required. 3-Way Coupler Leash by Zack & Zoey - Jet Black Customer Photos - Send us your photo! Zack & Zoey's 12" 3-way coupler, and American River Cushion Grip Dog Leash, make ferrying our doxie boys to-and-from the dog park a breeze! Zack & Zoey's 3-way coupler and American River Cushion Grip Dog Leash make ferrying our doxie boys to-and-from the dog park a breeze! Almost caught a picture of Allie with her lead in her mouth! Allie is eight months and still chewing (which is why I've ordered so many of your 3-way couplers). Our Brood Smiling on a Sunny California Day! Thank goodness for this triple coupler. The biggest challenge of growing my cavalier duo to a trio was the endless tangle of 3 leashes when out and about with my pups! This triple coupler has simplified the walking experience and I bought the 24 inch to allow my pups enough room to potty without being right on top of their siblings. Posted On 04/10/17 by Joan P from Shreveport, LA Yes, Joan P recommends this product! We are going to have to work on this. All three dogs want to go in 3 different directions. When one has to stop to potty, that one gets yanked over by the 2 that continue on. Definitely going to take some training! Posted On 04/21/16 by Linda S from Vancouver, WA Yes, Linda S recommends this product! I own several two-way couplers and decided to try the three-way. Not really excited with how small(width) the leads are on it. Not positive I can trust it and will probably just continue to use my two-way coupler. Posted On 07/31/15 by Miriam R from Plato, MO Yes, Miriam R recommends this product! We love using this convenient 3-way coupler to ferry our dogs short distances, like to-and-from the car to the dog park. The 12" version provides just the right amount of comfortable leeway for our three 20lb dachshund collective, and avoids the tangles individual leashes often result in. It's made of the usual Zack & Zoey quality materials we've come to trust and, on sale, it was a great price too! I love this coupler. I have 3 dogs and this certainly makes walking them all at once much easier. Posted On 12/10/14 by Jessica J from Dallas, TX Yes, Jessica J recommends this product! This was extremely helpful for my 3 dogs. However, it was a bit skinnier than i thought. I might need to get a thicker, sturdier one as I have 2 beagles and a french bulldog.